On one of our trips to wineries in the Niagara Peninsula, we learned that if Icewine were a stringed orchestra, Riesling would be the violins and Vidal would be the cellos. We were thrilled to receive a bottle of Tzafona Cellars 2015 Vidal Icewine, and immediately thought of Yo Yo Ma. According to the back label, Tzafona is an ancient Hebrew word meaning northward. Wineries along the Niagara Peninsula are among some of the most northern wineries in North America. 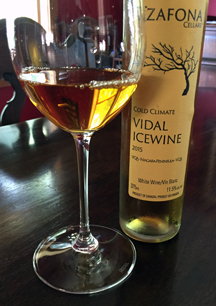 Tzafona Cellars’ Vidal Icewine would be a perfect sweet accompaniment to desserts on Yom Kippur.